5.1 Q: Why is my hoya plant not flowering? 5.2 Q: I got a hoya kerrii and it’s not growing. Epiphytic hoya plant, also known as the wax plant, is a popular houseplant. 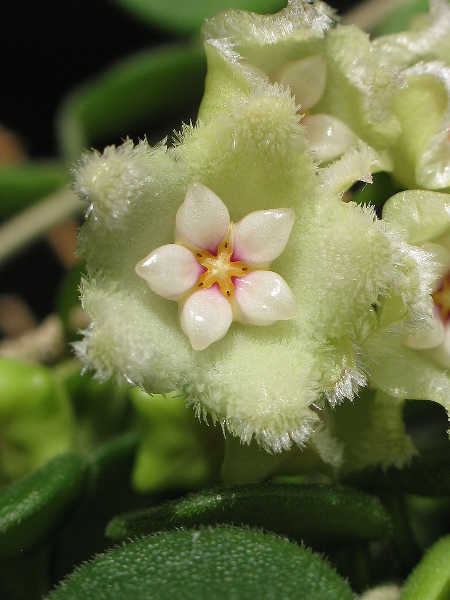 With clusters of star-shaped flowers adorning it, this waxy-looking species survives with only the bare minimum of care. But what does that care entail? Today we’ll delve into the sweetly-scented world of the hoya plant to learn all about the best way to grow it. 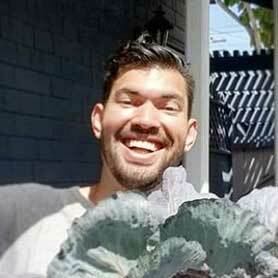 Every aspect of its care will be mentioned, from watering all the way through propagation. By the time we’re done, you will be a hoya expert, and you’ll want to grow this bright, starry-flowered and aromatic plant at your home! Soil Extremely well-draining soil required. Can use an orchid potting blend or a homemade blend with lots of perlite, pine bark and peat moss. Fertilizer Higher nitrogen fertilizers for plant growth, high phosphorous fertilizers to stimulate flower development. Liquid fertilizers preferred. Pests Sap-sucking pests such as aphids, spider mites, mealybugs and other scale insects are common. Also can be affected by caterpillars, snails and slugs, whiteflies, and thrips. Susceptible to sooty mold and fungal root rots. The family of hoya plants is 200-300 different species with multiple different cultivars. Some bear gorgeous and aromatic flowers, others are vines with a wide diversity of leaf shapes. While we can’t cover it all in one piece, let’s look at a few of the most popular varieties to grow at home. Sweet-smelling hoya carnosa is one of the most popular of the hoya plant varieties, with many different cultivars available. It has won the Royal Horticultural Society’s Award of Garden Merit for many of those cultivars, and is a phenomenal houseplant. 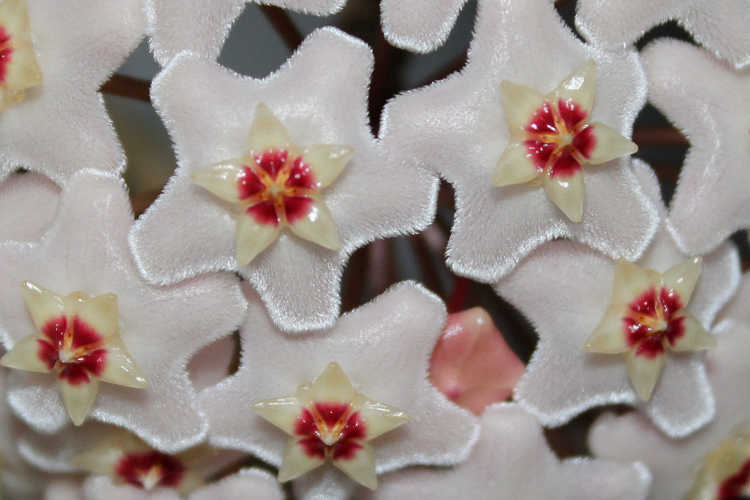 Originating in eastern Asia and Australia, it has waxy foliage and the star-shaped flowers common to all hoya varieties. It tends to grow as a vining plant. Reputed to be a great cleanser of indoor air pollutants, it’s a popular plant to grow. 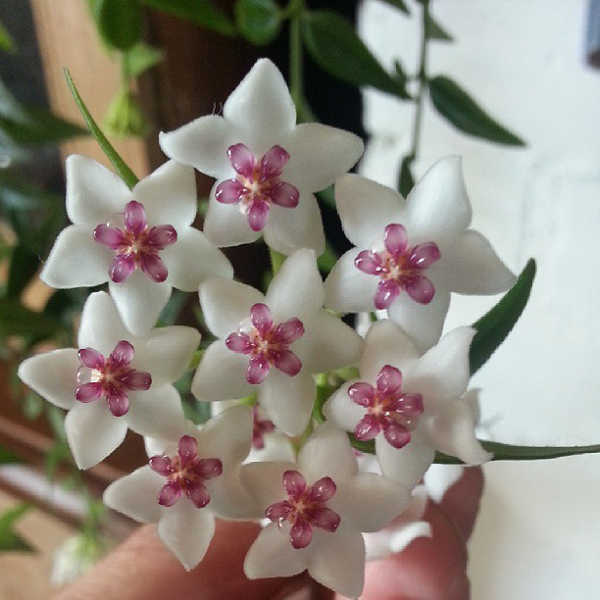 With shiny, succulent leaves and a vining habit, the common waxflower is a common butterfly attractant in its native Australia. 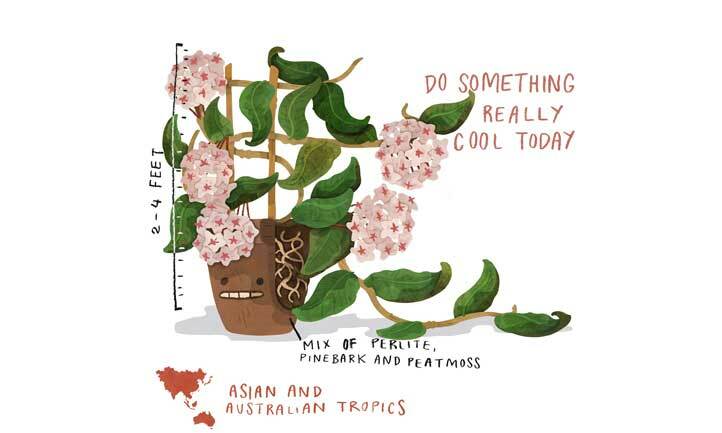 This hoya plant loves sunlight, growing along the edges of rainforests and on rocky outcroppings in the eastern and southern parts of its native ground. Hoya australis is often grown as a houseplant in Australia, and is beginning to make an appearance in other areas of the world as well. Waxvine can be grown indoors or outdoors in full sun conditions. 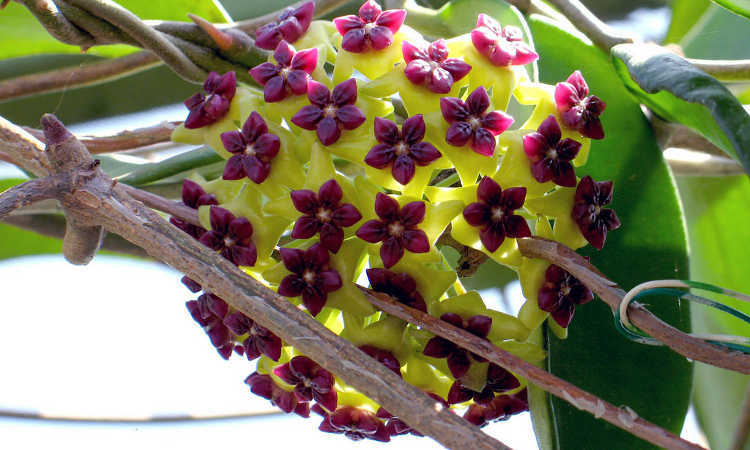 Originating on the island of Java, Hoya cinnamomifolia gets its name from the shape of its leaves. The leaves resemble those of the Ceylon cinnamon or “true cinnamon” plant in shape and size. While this hoya plant is not often grown in gardens, it is notable because of its distinctive flowers, which have outer petals in green to yellow tones. The inner petals are a rich and bright pinkish-red to dark red in coloration. Called “Lucky-Heart” or “Sweetheart” due to the shape of its leaves, hoya kerrii comes from southeastern Asia. This is a very popular houseplant in that area of the world and in Europe, where it’s sold around Valentine’s Day. When purchased at a garden center, this hoya plant is sold as a single heart-shaped leaf in a pot. It can take a couple years before it starts to grow in size, but when it does, it rapidly forms a vining habit and spreads out quickly. Its flowers are pinkish to yellowish with a deeper pink center star. 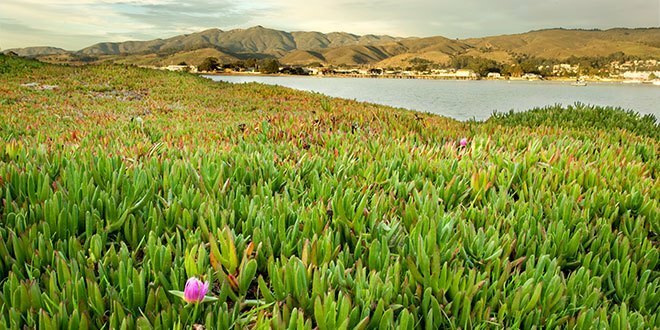 Found in the Himalayas, the green wax plant is a rapid-growing vine. Its flowers have a greenish tint and appear to be furry or fuzzy. The only bright spot in these flowers comes from a tiny bit of yellow at the center flanked with hints of a deep pink hue. Otherwise, the rest of the flower tends to be cream to pale green in coloration. Round and waxy-looking leaves are often more common than the pale green flowers, however. This plant does like to produce lots of deep-green leaves along its vine! Surprisingly, the wax plant is pretty easy to care for. Once you’ve learned a few tricks, you’ll be able to grow this plant for years to come! Bright, indirect light is perfect for hoya plant growing. While they can tolerate full sun conditions in the spring or fall, the summer sun can scorch the succulent-like leaves and cause color bleaching. Ideally, ensure your hoya plant has at least 6 hours of bright and indirect sunlight per day. Using a grow light to supplement the sun’s rays is an option. 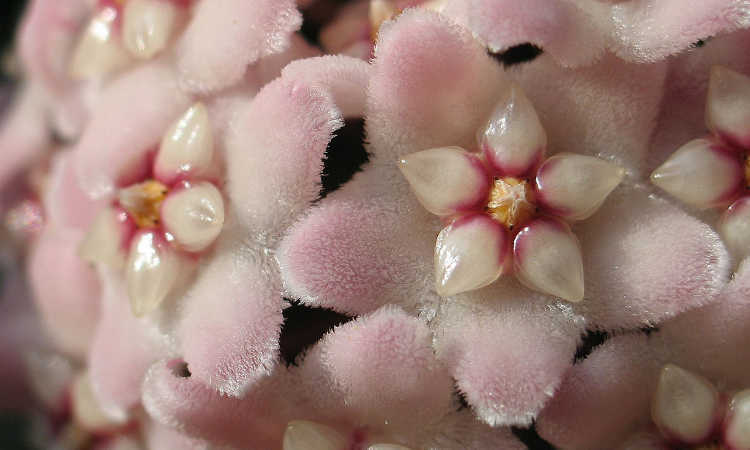 As a tropical plant, hoya prefers temperatures over 50 degrees Fahrenheit. Some varieties actually prefer it to be in the 60’s or 70’s. For indoor growers, this is perfect, as many of us tend to keep our homes between 60-70 degrees. Outdoor growers should be sure of the lowest temperature their specific hoya plant will grow at. Bring it indoors when the temps dip too low. As far as heat goes, while there are cool-temperature hoyas which prefer it to stay below 80 degrees, the vast majority can tolerate temps to 95 or even higher. Just be sure that they have some protection from the heat during the hottest part of the day, and some shade to keep the plants from wilting in direct sunlight. Do something cool today. Custom illustration for Epic Gardening by Seb Westcott. 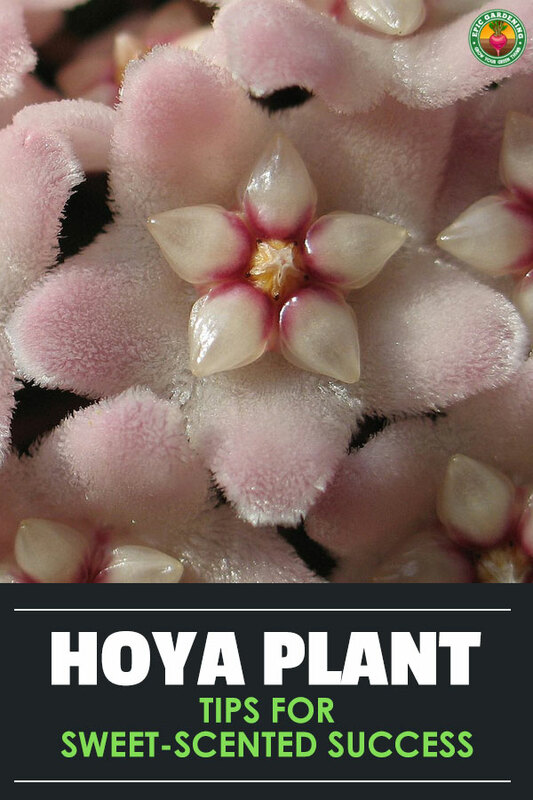 As epiphytes, hoya plants naturally live in low-water environments. They are quite easy to overwater, and suffer ill effects including root rot if kept in soggy conditions. Spring and summer are the times when a wax plant is thirstiest. At those times, the plant is going through its major growth for the year, and will need that water to expand and bloom. Check the soil to see if it is moist. If it’s dry in the top inch or two, water to moisten the soil. Do not flood the pot or allow water to pool. Allow the soil to completely dry out in those top inches before watering again. In the fall and winter months, hoya plants tend to go somewhat dormant due to cooler temperatures. During these times, you can water them much less often. Many indoor growers find that in the fall and winter, they only have to water their plant about once per month. Hoya plants are epiphytic and thus don’t require heavier, more traditional soils. Often, a blend of pine bark, perlite and peat moss is perfect to grow your hoya plant in. One soil blend which has proven popular is a mix of one part pine bark to two parts peat moss, with a bit of dolomitic lime mixed in to reduce the acidity of the blend. Add perlite to lighten it and increase its drainage capability. You can use a commercial potting soil, but may need to add extra perlite to the blend to lighten it up significantly. An orchid mix is a good choice, as it tends to be light and extremely well-draining, as the plants require. As the hoya plant is mostly a foliage plant, it requires a lot of nitrogen to spur its growth. 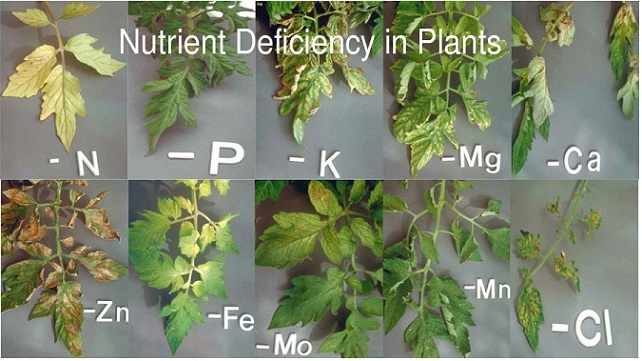 New plants should be given a high nitrogen fertilizer on a regular basis. If fertilizing with a liquid, use a 2-1-2 or 3-1-2 once or twice a month to encourage growth. Once your plant is a good size, you will want to switch to a high phosphorous fertilizer to encourage blooming. Many people opt for a fertilizer that is a 5-10-5, water-soluble fertilizer, but simply dilute it. 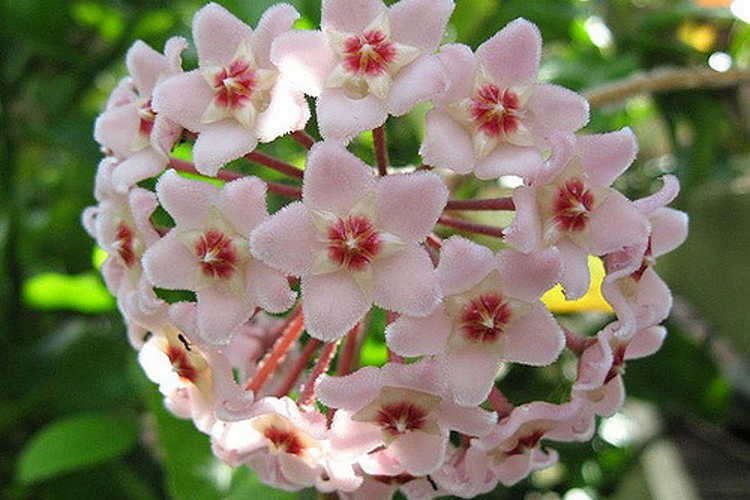 The different varieties of hoya will bloom at different times during the spring or summer. If you switch to a high phosphorous fertilizer about a month prior to your plant’s blooming period, it can produce stunning flower growth. It’s generally accepted that liquid fertilizers work well for the hoya plant, but only if you exercise caution. Too strong of a liquid fertilizer can burn the plant and cause damage. If you are concerned about the strength of your fertilizer, opt to dilute it somewhat to protect the plant. Too little fertilizer is safer than too much. Fertilizing is not as necessary during the winter months when your plant is dormant. Most growers recommend not fertilizing during the winter at all. However, if you still wish to, use an extremely low fertilizer ratio, around a 2-1-2, and fertilize no more than once per month. There are multiple ways to start hoya, but the easiest ways are from stem cuttings or layering. Stem cuttings should be taken from the softer wood or new growth of the plant, and should be 4-6″ long with a few leaves. You can root these in water or in a lightly-dampened growth medium. Cuttings like this tend to root quite well and will grow more quickly and readily than other types of cuttings. Layering is a technique where you use pins to anchor a softwood tendril from one plant to the soil to encourage it to put down roots. This can take a little while, but can be quite effective. I recommend doing this by extending the tendril to a second pot and pinning it there. The roots will form from the stem, and once it seems established, you can snip the tendril free from its mother plant and allow it to develop on its own. There are two other propagation techniques which are a bit more complex to do. 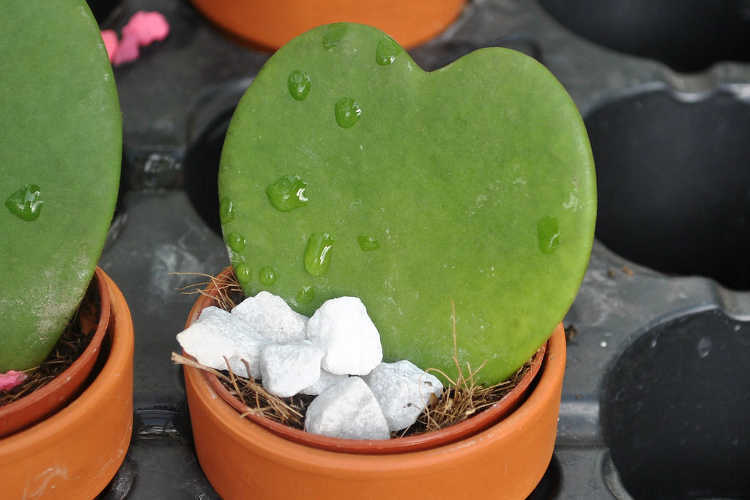 Leaf cuttings are often done for plants such as the lucky-heart. In this technique, a leaf will be snipped off just below its petiole and will be placed in a pot to root. While leaf cuttings can in fact form a new plant, this process tends to take much longer than stem cuttings or layering. It can take a couple years to experience significant growth from your plant if it is from a leaf cutting. Finally, hoya plants do produce seed. Much of the seed isn’t viable, but occasionally it is. It may or may not have the growth habits of its parent plant. Since it tends to be so variable, most people do not try to grow hoya from seed, but it is certainly an option if you want to try it. 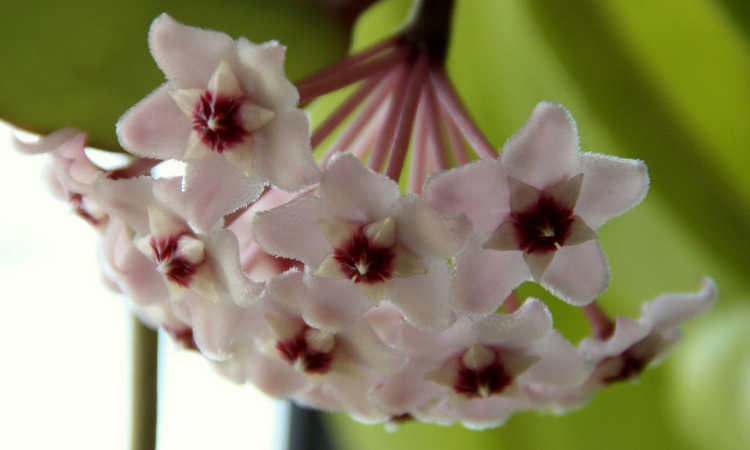 Unlike most plants, hoya plants like to be a bit rootbound to produce flowers. However, they will eventually outgrow their containers. If you can see roots beginning to appear around drainage holes, it’s time to repot your hoya plant. Plants in flexible plastic pots can be tested by gently pressing against the pot’s sides. If it’s firm and has no give, it’s time to repot. Ideally, repot your hoya plant in the spring or early summer, as this is when it’s in its active growing stage. Select a pot that is no larger than 1-2 inches wider and taller than your current one. Too much space can actually stunt your plant’s flowering ability and may pose a danger to its roots from excess moisture in the soil. Do not repot it any lower in the pot than it was in its earlier pot. While hoya plants can form roots along stems and from leaves, they also require some airflow around the plant to avoid plant damage like rot or decay. While hoya plant tends to be very hardy, it can require some light maintenance to keep it healthy and happy. Here’s how you do it. Remove any wilted, damaged, or dead branches/leaves. Often, these will have a yellowish or brownish appearance, and will be easy to identify. Also prune away any material which appears to be diseased. This can have a chalky or dusty look, and in glossy-leaved specimens can contribute to dull or matted-looking leaves. Any other pruning is purely cosmetic, but should be done with caution. 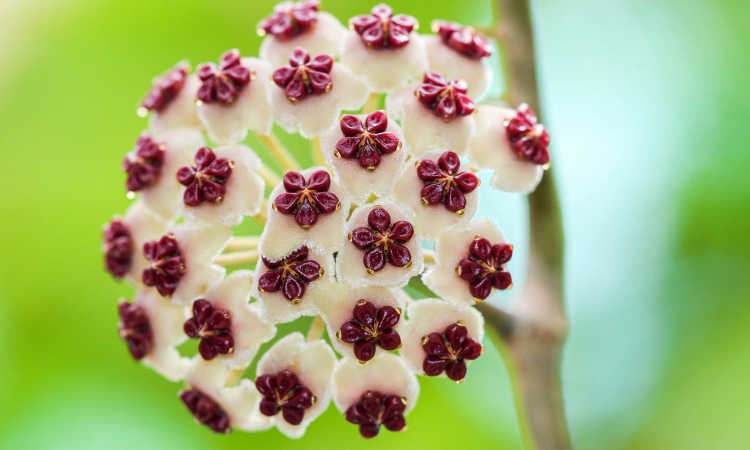 For hoya plants, new flower growth can occur on older flower stems called spurs. Those spurs will flower year after year. Avoid removing those to ensure your plant can continue to flower. It’s also unwise to remove too much of the trailing length of your hoya plant. Not only are those trailing arms beautiful, but they’re also necessary. If the plant cannot grow in size, it won’t fill its pot and start producing those star-shaped flowers we all want. I prefer to trim only when there is visible signs of damage or disease, and my hoya plant is quite happy with those conditions. If you do have something which is just bugging you, trim it, but do so carefully so as to encourage further growth. Hoya is a surprisingly carefree plant, and has very few problems that you might encounter. It’s good for all levels of gardening skill. However, there still are a few issues you may encounter. This section will help you figure out what went wrong. 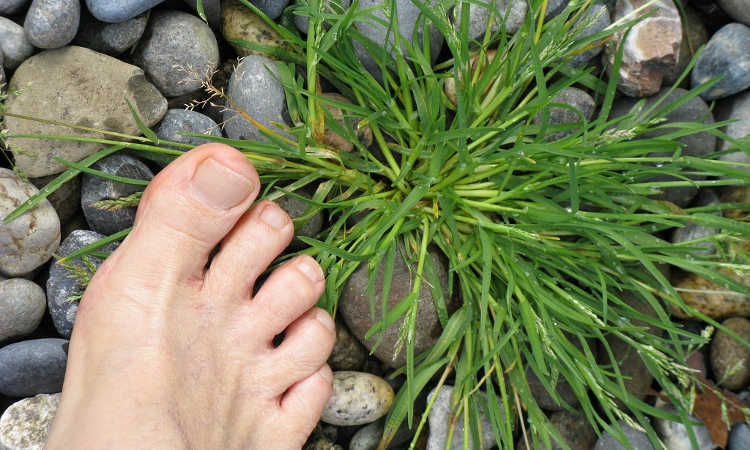 Most growing problems spur from watering issues. It’s extremely easy to overwater a hoya plant. That can induce root rot and kill your plant. However, underwatering can cause wilting and yellowing of leaves. Due to the epiphytic nature of hoya, it’s best to err on the side of underwatering. The plant will perk right back up if it shows signs of too little water and gets some, but it doesn’t work as well the other way around. Soggy soil is a major problem, so water carefully and in limited amounts. Most of the pests which will attack hoya are sap-suckers. Aphids, mealy bugs and other scale insects, and spider mites are some of the most common culprits. Thankfully, all of these pests can be controlled with the use of neem oil. Simply spray neem oil on all surfaces of the plant, and it should reduce or remove the population of these common pests entirely. There are other pests which are reputed to attack the hoya plant, but very few of them are common invaders for this plant type. Whiteflies and thrips can become problematic if they’re in high population numbers in your yard already, but the hoya plant isn’t their first choice of target. Similarly, some forms of caterpillars will eat hoya leaves, but they prefer other plants. 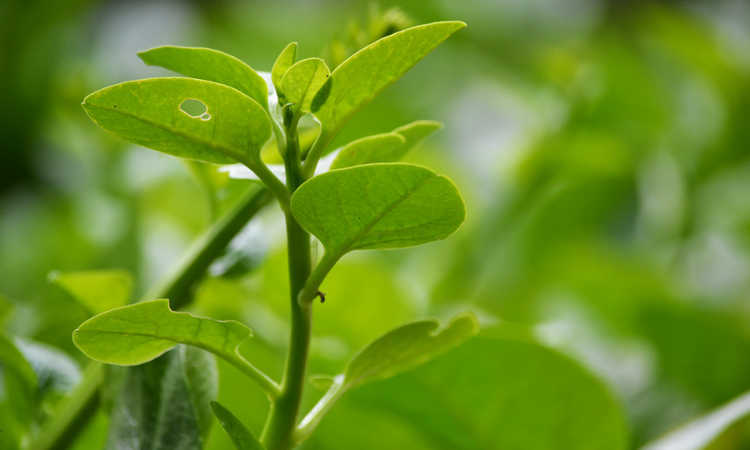 Insecticidal soaps like Safer Soap can be used to combat whiteflies and thrips, although thrips will also respond well to the use of neem oil. Caterpillars are going to require a different tactic. Use Monterey BT to wipe out caterpillars on your plants. The only other pests you’ll need to watch for are snails and slugs. Use something like Garden Safe Slug & Snail Bait to keep these at bay. The most common disease amongst hoya growers is sooty mold. This black mold forms on leaves that are sticky with plant saps or nectars, and the hoya flowers can produce enough sweet-smelling nectar to cause it. Aphids can also cause sooty mold due to their production of honeydew. Thankfully, sooty mold is very easy to deal with. Simply wipe off the mold with a damp cloth. If you want, you can spray a diluted seaweed fertilizer over the area where the mold formed, which seems to stave off mold formation for a bit. Botyris blight can form on the leaves of hoya plant. This starts as greyish fungal patches towards the center of the plant. As it develops, it can cause leaves to become mushy or to collapse. This can be treated with the use of a copper fungicide such as Bonide Copper Fungicide. Finally, there is the dreaded root rot. Caused by moisture in the soil which aids fungal development, this can be prevented simply by not overwatering. If your plant begins to wilt or form black or brown stem or leaf lesions, root rot may be the cause. Spray with a copper fungicide both on the soil and the plant itself to try to reduce the effects of root rot. If the roots themselves are black and mushy, your plant is beyond redemption, and should be disposed of. Q: Why is my hoya plant not flowering? A: There’s a lot of possible reasons for this. If it’s too young, it won’t flower. Hoya likes to be a bit rootbound to produce flowers, too, so if you recently repotted it, that might be the culprit. Pruning heavily may have accidentally removed the flower spurs from which the flowers grow. And it simply might need more phosphorous to stimulate flower growth. It’s hard to gauge which is the actual cause. If you haven’t pruned your hoya recently, that won’t be the problem, so it’s usually the easiest thing to check. Adding fertilizer at the right time (about a month prior to blooming, and then again right as it blooms) is the second easiest option. If it still won’t bloom at that point, be patient and wait another year. Sometimes it’s simply that your plant wants to grow more first before it provides those huge bundles of starry flowers. Q: I got a hoya kerrii and it’s not growing. A: Hoya kerrii is often propagated through leaf cutting. Unfortunately, leaf cutting is one of the slowest ways to generate more hoya plants, and it can take a couple years before it really shows signs of much growth. As long as the heart-shaped leaf remains green and it seems to be alive, it probably is. Just give it some time and care and it will eventually flourish! 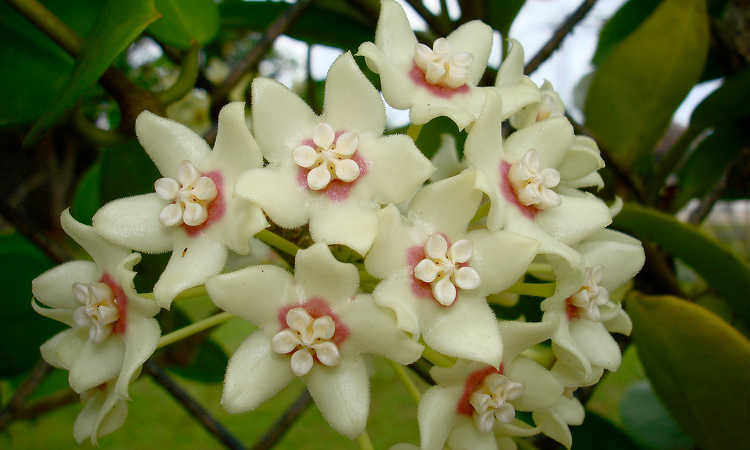 Ready to grow your own selection of tropical star-flowers? The hoya plant’s really quite easy to care for, all things considered, and it’s well worth adding to your houseplant collection! Do you have a favorite hoya plant? Share your stories in the comments! this is a plant that has really grown for me and I love it. While it can be grown outside, the difficulty is that its natural climate is very specific. It likes bright but indirect lighting, as it can be sunburned in full sun. However, it also prefers warm tropical climates that stay above 60 degrees. For most of us, that means that if it’s moved outside, it would need to be in a greenhouse or other controlled environment where lighting and temperature are easier to regulate. Hoya plants like to be a bit rootbound in their pots. Unless you’re seeing roots coming out of the drainage holes in the pot, it probably doesn’t need to be repotted! If you still want to repot, pick a very slightly larger size of pot, no more than 1-2″ wider. Transplant it over in the spring or very early summer when it’s actively growing. Since sending my comment earlier, I have looked at the infestation on my Hoya with a magnifying glass. They appear to be tiny bright yellow insects that move and have a couple antennae. If it’s bright yellow insects, it’s quite likely to be aphids. Spray your plants on all surfaces (being sure to get the underside of leaves as well as the tops) with some neem oil. Repeat weekly as necessary until they’re gone. My hoya, which is not new, has suddenly developed tiny yellow droplets on the flower stems. In all the years I,ve had Hoyas I have never seen this. Would like to know what it is and how to treat it – before it spreads to other Hoyas. From your description, it sounds like you’d developed botrytis cinerea on the hoya’s leaves. Removing the side that was damaged was the right call! However, if it starts to occur again, you might be able to use a liquid copper fungicide to kill off the fungal growth (those grey-black spots on the underside of the leaves). Spraying all of the leaf surfaces regularly with neem oil may also help prevent it from coming back. As for repotting, I would consider doing it in September. In your part of the world, you’re just heading towards the summer months, and you want to give your hoya enough time to establish itself. Look for spring-type weather, even if it’s early spring, for repotting your hoyas. You can keep them in the greenhouse for a bit if it’s still chilly as well. Unfortunately, I don’t have any recommendations on where to get other varieties of hoya in your part of the world, because it really depends on what’s allowed to be imported. Different countries have different rules in regards to the plants. I’d ask your local nursery professionals for some recommendations, though! Kevin thank you for yor advice I do appreciate it. first let me say I am not an experienced gardener! If I decide to keep all their growth and branches how do I deal with them in the garden? Hey George, I’ve seen a few gardening friends do quite well by having them grow up a trellis, or droop down in a hanging planter or container! Arrived to take a cutting from a large Hoya with the help of your site….which i found interesting, and full of information. Thankyou…. You’re welcome Anita! Greetings over there in Malta! You can definitely use Miracle Gro if you like. I also have an article on the best potting soils on the site. I just repotted my Hoya couple of weeks ago. It sits near a window and gets the bright light from the West for about 10 minutes before the sun sets. I have been noticing that the new growth (small red leaves) are falling off. I have new long stems growing. Concerned about the new growth, what am I doing right/wrong? If it’s only getting about 10 minutes of light per day, it’s probably desperate for more. Hoya plants require about six hours of bright, indirect lighting per day. The long stems growing could be a sign of the plant trying to stretch out to find more light too (although it could also just be the trailing nature of the plant). While you don’t want it to be in direct sunlight for long periods of time, I would consider moving the plant to a brighter location. That should help! 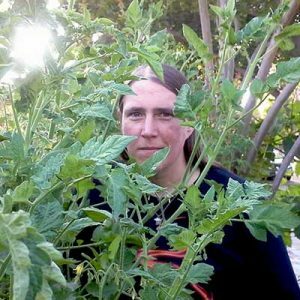 I don’t recommend trimming unless there’s signs of disease, but from your description it sounds more like either a lighting or watering issue than disease-based.